This 1932 issue of Liberty magazine contained a recipe for a Japanese salad. Real life stuff has kept me from doing the fun cooking and researching that I want to do. I have a few topics in line but no time to put them together or try the recipes! Augh! But, have no fear — I do at least have an old recipe for you to enjoy today. This is from the August 27, 1932 issue of Liberty magazine, page 50, in the “To the Ladies!” column by Princess Alexandra Kropotkin (“linguist, traveler, lecturer, and authority on fashion” — she was the London-born daughter of the famous Russian anarchist Peter Alexeyevich Kropotkin). “To begin making this Japanese salad you first peel some potatoes and cook them in meat bouillon with a bay leaf. Dice the potatoes while warm. With every two cups of diced potatoes use one cup of cut-up shrimps, half a cup of diced tongue, and two tablespoons of chopped chives. “For the dressing use one tablespoon of the hot bouillon in which the potatoes were cooked, one tablespoon of vinegar, two of salad oil, a scant tablespoon of sugar, half a teaspoon of soy sauce, pepper, and a speck of ground mace. Chill well. I am pretty certain I won’t be making this one. It contains two things that are Kryptonite to me: tongue and beets. I once had a traumatic experience when I was invited to dinner with a boyfriend’s parents, and the dinner consisted of boiled, unseasoned tongue sliced in cross-section (the father could not have salt and apparently anything else that makes food taste interesting was off-limits, too) and canned string beans. (The only drink offered was water, which might have been all right if the food was edible, but it was not. I imagine the average prison food is better. It certainly is likely to have more flavor.) So tongue was off the menu for me after that, even when I did still eat beef. I don’t know how “Japanese” this salad actually is. It strikes me as pretty western, despite the half teaspoon of soy sauce. If this actually is Japanese, I would love to know. A couple of interesting gadgets, there. 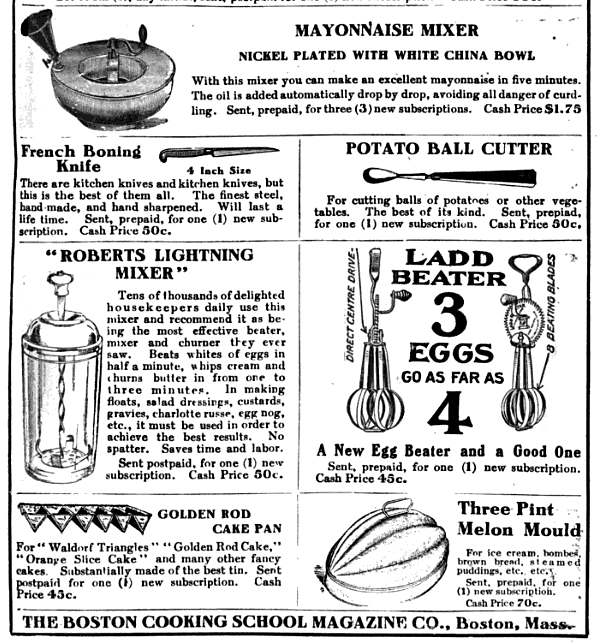 That Roberts Lightning Mixer looks useful, and the mayonnaise mixer… well, you’d have to make a lot of mayonnaise to make that one worth taking up space in the kitchen, but if you do make a lot of mayo, I can see that it could be helpful. But the one that mainly caught my attention is the one at the bottom of the page: “Golden Rod Cake Pan,” an oddly-shaped pan that appears to make triangular cakes. Since the inspiration for this blog, a year ago, was the similarly-named “Gold-n-Sno Cake,” I was particularly curious. What was the Golden Rod Cake? A quick Google search turned up this post by the Old Foodie, who looked into the topic last year, complete with three interesting recipes. Here are a couple more recipes for the Golden Rod Cake. Eighteen ounces powdered sugar, nine ounces butter, sixteen ounces eggs, one tablespoonful vanilla, one pennyweight soda, two pennyweights cream tartar, eighteen ounces pastry flour. No instructions whatsoever. No reference to the icing that many of the other recipes have. And no orange. Is this a related cake or something different? Here’s a pair of recipes from Perfection in Baking, 1899. The first recipe is very close to Mrs. Chandler’s recipe, above. Perhaps we can assume that Mrs. Chandler just didn’t mention the orange icing because it was assumed that any reader would know that Golden Rod cakes would have orange icing. TO SELL AT 15 CENTS EACH. Cream together one pound of fine sugar with ten ounces of butter and one and a half pints eggs, one pennyweight of soda, one teaspoonful of vanilla, twenty ounces of cake flour, two pennyweights of cream of tartar. When baked, ice the sides with orange water icing. TO SELL AT TEN CENTS A PIECE. With one pound of butter and lard cream one and one half pounds of sugar, ten eggs, two thirds of a pint of milk, juice and grating of two oranges, two pounds of cake flour, one ounce of baking powder. Mix and bake like above. Ice some with orange, some strawberry, some chocolate. On one side ornament the name “Golden Rod” in different colors; that is, if cakes are frosted chocolate, ornament in yellow; if iced yellow, ornament in pink or white, etc. Beat the yolks of six eggs very light. Gradually beat into these half a cup of sugar, then two tablespoonfuls of milk or orange juice, and, lastly, half a cup of sifted flour, sifted again with a level teaspoonful of baking powder and a few grains of salt. Fill the moulds or pans with a teaspoon, tapping the moulds on the table, to cause the mixture to settle to the bottom of the moulds. Bake in an oven a little hotter than for ordinary sponge cake, and turn the cake from the tins as soon as it is removed from the oven. Flavor with a grating of orange rind, or half a teaspoonful of vanilla extract. The recipe will make twelve triangles or charlotte russe cases. The mixture is finer-grained and more tender than the usual sponge cake. Cover the triangles with boiled frosting, and sprinkle with chopped pistachio nuts. Beat the yolks of six eggs very light. Gradually beat in half a cup of fine granulated sugar, then two tablespoonfuls of milk or orange juice (lemon juice will not do) and, lastly, half a cup and one tablespoonful (for difference in flour) of sifted flour, sifted again with a level teaspoonful of baking powder and a few grains of salt. Bake in an oven a little hotter than for ordinary sponge cake. Flavor with half a teaspoonful of vanilla extract or a grating of yellow orange rind. Putting all this together, what we have is a fairly fine sponge cake, frequently with orange flavoring, shaped something like triangular ladyfingers, and sometimes used the same way (which might explain the lack of icing in Mrs. Chandler’s recipe—if you were making these for a Charlotte Russe, you wouldn’t need the icing). I still don’t know the origin of the name, and I would really like to see how the Golden Rod cake was supposed to look. It would be fun to try to make them in the proper shape — does anyone know if pans like that still exist? I haven’t been able to find one. þose loysyns er harde to make in fay. 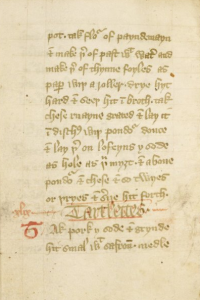 This rhyming recipe was written in Middle English, around 1420-1440, in the Liber cure Cocorum. You can see a 19th-century transcription of it here at Google Books, and here at Greg Lindahl’s website. The latter site also has a modern translation by Cindy Renfrow. 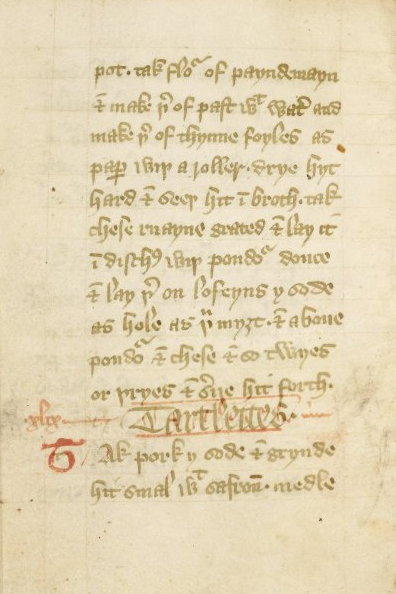 A page from The Forme of Cury, with part of the Loseyns recipe. Preheat oven to 350F. Grate cheese. Cook lasagne noodles in broth, then drain. 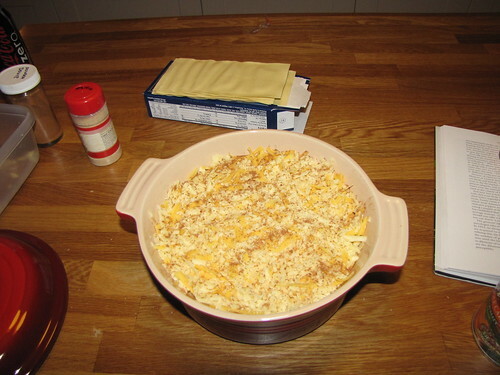 Put some grated cheese in the bottom of the dish. Sprinkle on some powder douce to taste. 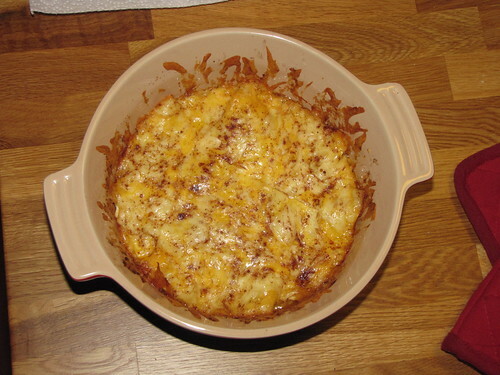 Layer cooked lasagne noodles over the cheese. Repeat about three times, alternating cheese/powder douce with noodles. Finish with a layer of cheese and powder douce. Bake at 350F for 30-40 minutes or until it is bubbly and nicely golden brown on top. The powder douce is a combination of flavors we think of in very sweet foods — it makes a killer cinnamon toast — and so the first time I made this, I thought that it might not taste good with the cheese. But it’s wonderful. And despite the complaint by the author of the Liber cure Cocorum, it’s not difficult. Boil pasta, grate cheese, layer the two, bake. You can’t get much simpler. Cooked and ready to eat! Unfortunately I don’t have a good picture of the loseyns nicely arranged on a dinner plate. But it was good and tasty.